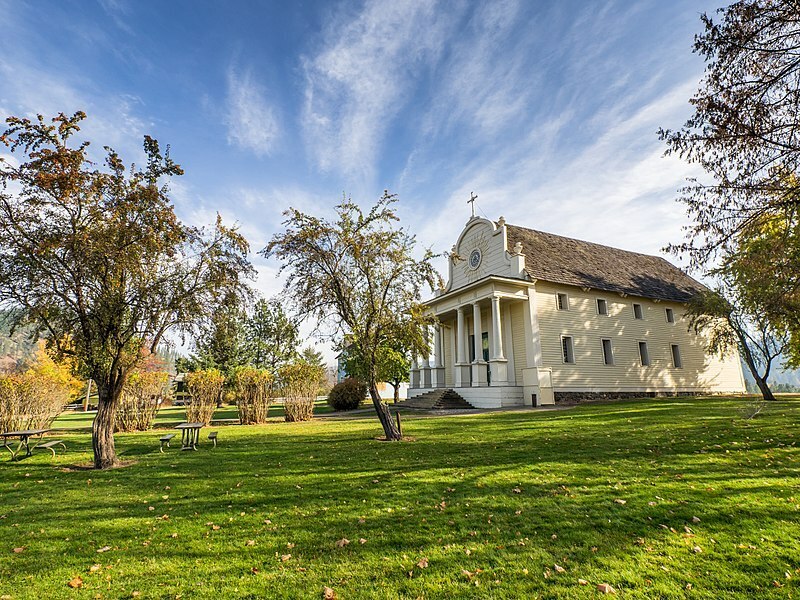 Located in Coeur d’Alene’s Old Mission State Park, the Mission of the Sacred Heart is the oldest building in Idaho. 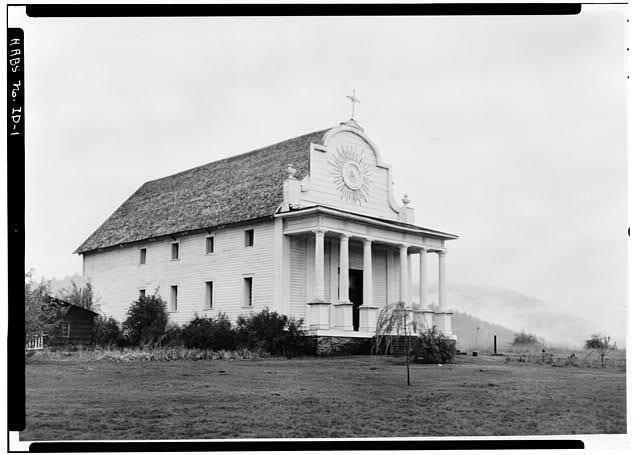 Also known locally as the Cataldo Mission, or Old Mission, the Mission of the Sacred Heart was built between 1850 – 1853 by Catholic missionaries and members of the Coeur d’Alene Tribe. It is listed on the National Register of Historic Places and is the oldest mission building in the Pacific Northwest. In the early nineteenth century, the Coeur d’Alene Indians began to hear rumors of men in black robes who possessed special powers. Curiosity about these alleged powers inspired the tribe to invite the “black robes” to live amongst them. Jesuit missionaries arrived in the St. Joe River area in the early 1840s and built the St. Joe Mission in 1842. Due to seasonal flooding the mission was abandoned and relocated near the Coeur d’Alene River and modern day Cataldo, Idaho. Father Antonio Ravalli modeled the mission after the cathedrals of his Italian homeland. Construction began in 1850 and three hundred Coeur d’Alene Indians and two missionaries built the ninety-foot-long, forty-foot-high, and forty-foot-wide building. The construction required creativity due to minimal building supplies. No nails were used, the chandeliers were made from old tin cans, and the walls were built by weaving grass and straw over a framework then solidifying it with river mud, a method known as waddle and daub. When completed in 1853, the Mission of the Sacred Heart became an important stop for westward settlers, miners, traders, and religion seekers. The original goal of the mission was to serve as a reduction community, bringing Indians from nearby communities to one gathering place to focus on religion and the adoption of Jesuit agricultural practices. It also provided supplies and hospitality in this remote part of the West. By the 1870s, the mission and surrounding farm had grown to between eighty and one hundred acres and made full use of the Coeur d’Alene valley for grazing and cultivation. In 1961 the Mission of the Sacred Heart was designated a National Historic Landmark, and in 1966 was added to the National Register of Historic Places. A mural of the mission can be seen on the walls of the Brumidi Corridors at the U.S. Capitol building and is the only landscape depicted there that shows a building that still exists today. The mission is the oldest building in the state of Idaho and is now a part of Coeur d’Alene’s Old Mission State Park. The park includes the Mission and the restored Parish house (which was burnt down in 1887), along with two cemeteries, nature trails, and a visitor center. FRONT and EAST SIDE ELEVATIONS - Sacred Heart Mission ~ Source: Everhart, William C., from the Library of Congress.“Historic American Buildings Survey William C. Everhart, Photographer October 1958 Front and East Side Elevations - Sacred Heart Mission, Interstate 90 & Interchange 39, Cataldo, Shoshone County, ID,” available at http://www.loc.gov/pictures/item/id0020.photos.059630p/resource/. 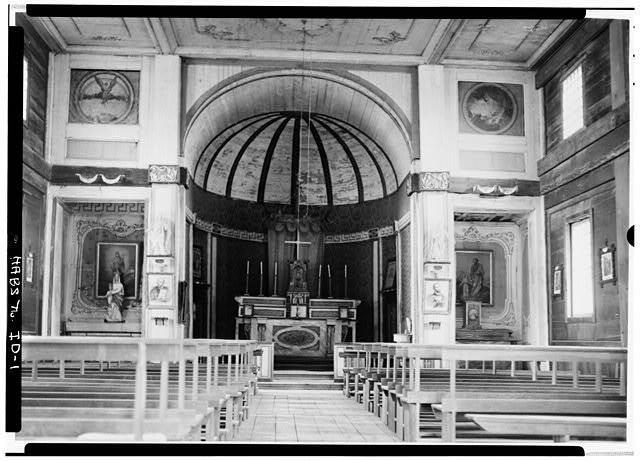 INTERIOR VIEW OF APSE - Sacred Heart Mission ~ Source: Everhart, William C., from the Library of Congress. “Historic American Buildings Survey William C. Everhart, Photographer October 1958 Interior View Of Apse - Sacred Heart Mission, Interstate 90 & Interchange 39, Cataldo, Shoshone County, ID,” available at http://www.loc.gov/pictures/item/id0020.photos.059638p/resource/. Cataldo Mission Interior 01 ~ Source: Geoff Cole Images, from Wikimedia Commons. “Cataldo Mission Interior 01,” available at https://commons.wikimedia.org/wiki/File:Cataldo_Mission_Interior_01.jpg. 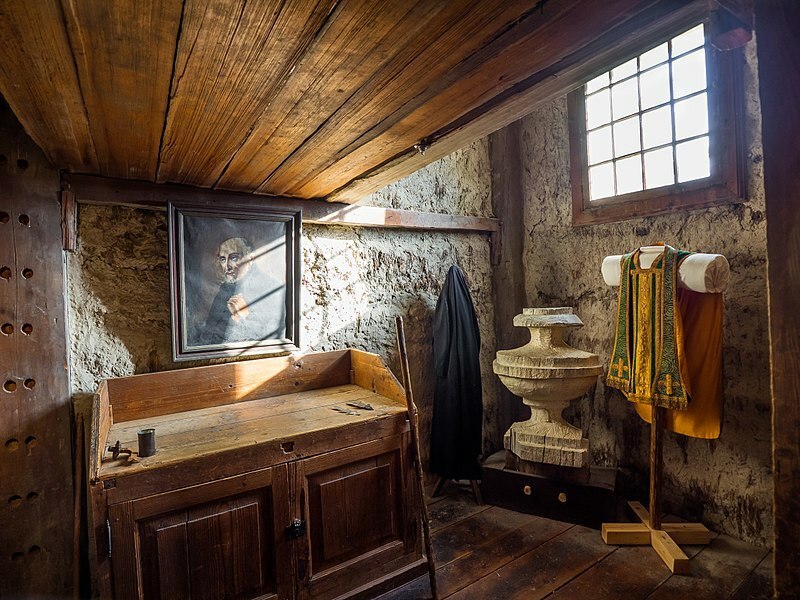 Cataldo Mission Interior 02 ~ Source: Geoff Cole Images, from Wikimedia Commons. “Cataldo Mission Interior 02,” available at https://commons.wikimedia.org/wiki/File:Cataldo_Mission_Interior_02.jpg. Trevor McEvers, University of Idaho, “The Mission of the Sacred Heart ,” Intermountain Histories, accessed April 19, 2019, https://www.intermountainhistories.org/items/show/172. Brodwater, Mike. The Spokesman Review. “Historical Monument,” October 8, 2005. Available at http://www.spokesman.com/stories/2005/oct/08/historical-monument/. Heilman, Devin. The Coeur d’Alene Press. “Old Cataldo Mission Shines on Historic Day,” July 30, 2016. Available at http://www.cdapress.com/archive/article-c1b045de-561c-11e6-98a3-3fdf9a4862d3.html. From Idaho Parks and Recreation. “Welcome to Coeur d’Alene’s Old Mission State Park,” available at https://parksandrecreation.idaho.gov/parks/coeur-d-alenes-old-mission. Accessed April 16, 2018. Palmer, Gary B. "Indian Pioneers: The Settlement of Ni'lukhwa̱lqw (Upper Hangman Creek, Idaho) by the Schi̱tsu'umsh (Coeur D'Alene Indians)." Oregon Historical Quarterly (2001). Available at http://www.jstor.org/stable/20615113. Spence, William L. The Lewiston Tribune. “Detective work uncovers unique history of Idaho’s oldest building,” May 20, 2016. Available at http://www.idahostatesman.com/news/local/article78791902.html. Tinsley, Jesse. The Spokesman Review. “Idaho’s Oldest Building Remains A Sacred Place,” October 31, 2011. Available at http://www.spokesman.com/stories/2011/oct/31/cataldo-mission/#/0.